[prMac.com] Payson, Utah - Faber Acoustical, LLC today announced that SignalScope Pro 1.2 is available for download on the iTunes App Store. 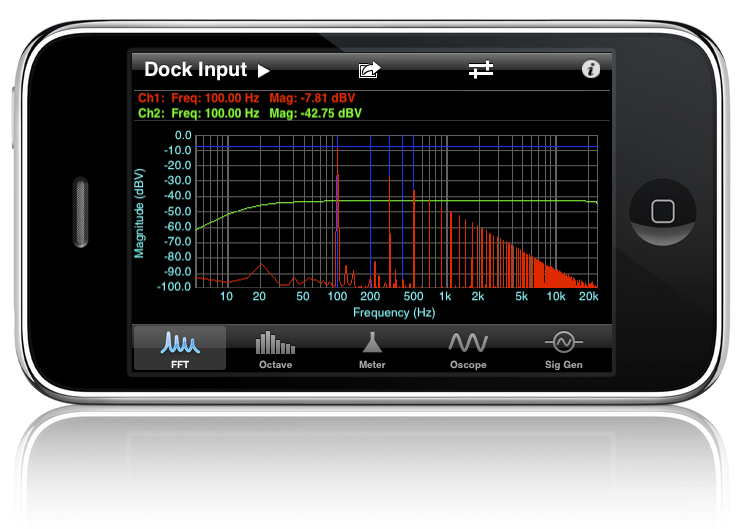 SignalScope Pro 1.2 includes all the functionality of SoundMeter, the original sound level meter app for iPhone. Updates to SignalScope and SoundMeter are also now available for download. SignalScope Pro turns an iPhone or iPod touch device into a hand-held dynamic signal analysis tool, with support for 1/3-octave real-time spectral analysis. SignalScope Pro's new Meter tool builds on what SoundMeter has to offer and extends it beyond measuring acoustic signal levels to support time-weighted and equivalent levels for any supported signal type (including voltage, current, acceleration, and velocity, in addition to acoustic pressure). Within the new Meter tool, SignalScope Pro gains SoundMeter's ability to post measured levels directly to a Twitter account or to send them via email. Levels can also be overlaid on an image from the photo library, or taken with the camera on an iPhone. The update to SignalScope Pro also brings with it several minor enhancements, including bug fixes. New maintenance releases of SoundMeter and SignalScope are also available on the App Store today. IMPORTANT NOTE: iPod touch devices require additional external hardware to get audio signals into SignalScope Pro. For audio signals, the 1st gen iPod touch requires a dock connector input device (such as the MacAlly iVoice Pro) to be used with SignalScope Pro. All other devices can perform measurements with the headset connector, but using a stereo dock connector input device is recommended for the highest quality measurements. SignalScope Pro is now available for download on the iPhone App Store for $74.99 (USD). External hardware may be required for analog input capability. More information on SignalScope Pro can be found at Faber Acoustical online. More information regarding suitable input devices for specific iPhone or iPod touch models can be found on the Faber Acoustical blog. Faber Acoustical, LLC provides cost effective tools for acoustical instrumentation, analysis, and education. Faber Acoustical's expertise include acoustical measurements, active noise control (sometimes referred to as active noise cancellation or ANC), mixed-signal circuit design, digital signal processing (DSP), adaptive filtering, and embedded DSP and desktop software design. Copyright 2009 Faber Acoustical. All Rights Reserved. Apple, the Apple logo, iPhone and iPod are registered trademarks of Apple Inc. in the U.S. and/or other countries.